We’ve found our new favorite vacuum! Shark sent us their Shark Rocket Powerhead vacuum and I don’t think we’ll use a clunky vacuum ever again. I hate carrying around a heavy vacuum all over the house, and especially having to lug it up the second floor. This 9 pound Shark Rocket Powerhead (not including the cord) is the ideal weight in my opinion. One of the ways they keep this vacuum light is that it doesn’t have a bag or a canister. All of the dirt is kept in the head of the vacuum and you empty it after every use (or a couple times per use if you have a messy toddler in the house). The breakthrough engineering combines motor and dust cup in the head of the vacuum, reducing airflow path and maximizing efficiency and power. Which means that this machine may be small, but if anything, it’s more powerful than some of our bigger vacuums. The interchangeable brushrolls are easy to assemble and clean. There’s an easy access button for floor to carpet brushroll transitions on the handle so you don’t have to lean over and push the button from room to room. The multi-position adjustable heights can be tailored to personal preference and pushed down for compact storage. You can find this vacuum at all major retailers for around $169, but enter the giveaway below! 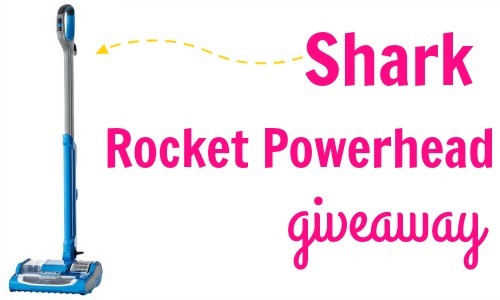 One Southern Savers reader will win a Shark Rocket Powerhead. Fill out the widget below to be entered to win. This giveaway is sponsored by Shark, but all opinions are 100% my own.